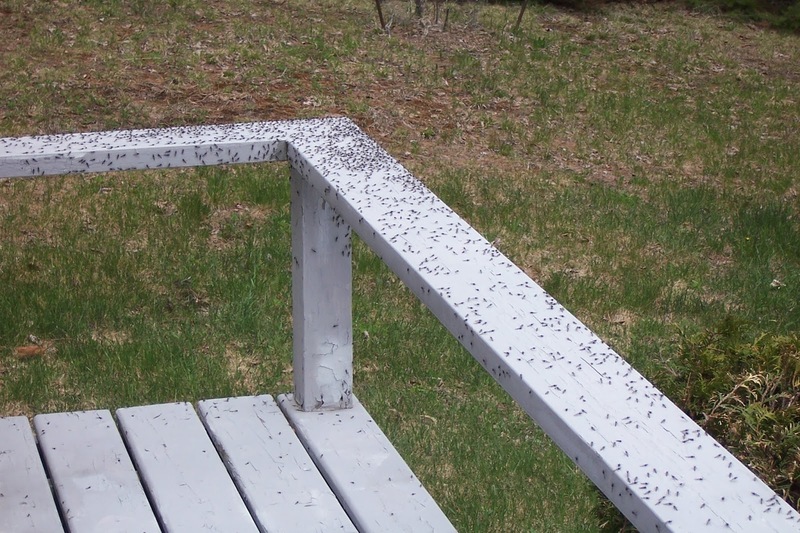 People in many parts of Minnesota have noticed this month large swarms of small, dark insects close to sources of water, especially lakes. These abundant insects are called chironomid midges. The larvae are usually aquatic and can feed on a variety of foods, such as algae and tiny bits of decaying plant matter. They are important food sources for fish and other aquatic animals. Different midge species emerge as adults at different times during the spring and summer. Emergence typically occurs in large numbers, especially during the evening. They are weak fliers and generally do not move far from the water. Midges vary in color from brown, gray, or green. Chironomid midges are mosquito-like but unlike mosquitoes lack scales on their wings and a long proboscis (mouthparts). Their first pair of legs is longer than the others. Males usually have feather-like antennae. Despite their similarity to mosquitoes, they do not bite people. But they can be annoying when they fly into people’s faces and land on surfaces in large numbers. Fortunately, these insects are short-lived; they will be active for only a few days and then go away on their own. For more information see BugGuide.